Join the discussion on our forums! Come discuss Surrender to Madness over in our dedicated Surrender to Madness discussion topic. This is a build-around card and is particularly useful with Spirit of the Dead and Bwonsamdi, the Dead, who can make the mana hit much less painful. It’s not a coincidence that Bwonsamdi costs 7 mana and this costs 3 (I.e. you play this with 10 mana after loading your deck with 1-cost minions and then play Bwonsamdi to draw them, giving you loads of powerful options your next turn to offset the tempo hit). 3 Mana, Permanently set yourself 3 Mana crystals behind. Losing tempo to gain value never seems to work... Just look at Lady in White. Sure this card is no Keleseth, but I think it's definitely playable. In a priest deck with a high amount of "midrange" cards (Tar Creeper, Stonehill Defender, Dragons, etc), this card could definitely give the win against control decks. +4/+4 (+5/+5 with Keleseth) on every minion in the late game eventually becomes too much for control decks to handle. This card does lack any use against aggro decks, but Priest is one of the best classes for dealing with early game aggression. This card could be a pretty strong contender for a slot in certain priest decks. tried this in the pre-release brawl.. this is actually a good card, quite slow imo, as you cannot play it on turn 3. you have to wait at least Turn 6, to try to get back the board with Duskbreaker or Scaleworm. another thing to to note, is that cards that died from the priest spirit after casting won't get the buff so timing is everything with this card. There is one decent use for this I think, and that is by combining this with Mojomaster Zihi. Play this at 9 mana and then play Zihi. Now your opponent is not 3 mana crystals ahead. Even after all the new cards I still don't see the point of trying to make this work. if you want Keleseth in Priest then just...play Keleseth? Even considering Bwonsamdi and Spirit of the Dead, what exactly is the payoff. You fill your deck with one drops, then play this and Bwonsamdi and somewhere around turn 11 you get to play a mediocre swarm deck. With the 1 mana reshuffle mechanics I can maybe see this find a place. Its too early to tell, but if the spirit + bwonsamdi + more deathrattle mechanics synergize well enough to handle the tempo hit I can imagine this spiralling out of control very fast. You dont really care that you have 3 less mana a turn if you're cards that usually cost 1-10 mana now cost 1 mana. Thematically this feels like a Warlock card not a Priest card. It doesn't feel right and without cards to support it I don't think we will see much of this card. 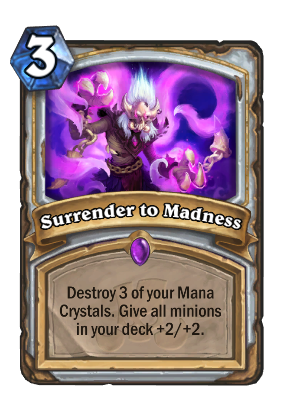 Surrender to madness is a Shadow Priest Talent spell from WOW, that gives you instant benefit of faster Insanity generation at the cost of health lost. Thematically it fits just right. I'm surely trying one copy in my Benedictus Control priest, since it's exactly 10 mana combo with very little drawback at that stage of the game. Cool concept. Sadly minions on hand aren't affected. Considering most priest players don't do much by turn 3 board wise I don't think it would be wise to even run this card. This is a flop, it will see no play much like a lot of other epic rarity cards existing in the game. Let's all stop and think for a moment... Regardless of what deck you make, in what situation is this card good? Turn 3? You can't play or draw at 1 mana, especially not against 4+ mana, aggro or otherwise. Midrange? It doesn't fit spiteful (as if it's still a thing) but +2/+2 could be really good... but you still have to draw after you play it. Maybe quest will like it...? Turn 10? How does that help? By that point you've either won the tempo battle, lost the tempo battle, are in topdeck mode, or are going for lategame value. I can see it being good like turn 10, benedictus and play this, but you still have to not die. Is it good to play more than one? No. Not at all. If you even play two, you start out 4 vs 10 mana, and we know from druids that's a bit unfair. If you manage to space them out reasonably (while still not dying and having cards to buff in your deck) with shadow visions, you could get to +8/+8 but what's the point? Personally I want to try it. But I think its strength can only come from a lategame play to put more pressure on control decks that may grind out, say, quest priest or odd priest. It's very niche. Especially when combo priest is better. But I believe in it. I want to give it a try. Besides, we haven't seen the rest of the cards yet. Exactly. This card probably wouldn't even see play if it also buffed the cards in your hand and only destroyed 2 mana crystals. Reminder that the only reason Keleseth was played is because the classes that do usually have a turn 2 play through hero power or 1-drops, and the card itself was a minion. If Keleseth was just a spell with the same effect we probably never would have seen it. NOt to mention that even during KnC and KoFT a double Keleseth on turn 2 was far from unbeatable, and that guy didn't nuke your mana crystals in a class that barely even has viable early game minions. Won't see play in the early game??? Turn 2+coin = 3 mana. You destroy 3 of your mana crystals, but you can't go under 1 so on turn 3 you will have 2 mana again... so you lost 1 mana cristal (and the coin) for +2/+2 for ALL cards in your deck!!! So it can be an early game option! That should have some timer like it had in WoW. F/e. Buff your minions, if you won't kill your opponent in 10 turns you die. Its terrible against aggro. Its bad in early game as well. But I can imagine it be played in 1 copy in, lets say, dragon priest (or just not spell-based priest) against control after like turn 8-10. Especially after Benedictus. And I can imagine it even be shadow visioned in really slow matchups. Like against odd warrior. Or big spell mage. Maybe against control warlock.